There are many great tools out there, but every now and then you come across one that changes how you shoot. Well, today I am sharing a review of one of those tools. Xume Adapters have changed the way I use filtration on my projects. What use to be a hassle when working with filters and multiple lenses, is now an effortless task. Ethics Statement: I did not pay for this review unit. I am not being paid for this review. Hey that is pretty cool, speed is everything! Thanks Caleb. We’ve already solved the lens cap issue: Pop your lens cap into a holder and it works great. We’re offering additional holders at discount with our kits so you can dedicate a holder or two to your lens cap(s). that’s cool! I wonder if shorter lens would potentially suffer some kind of focusing motor interference from the magnets? That’s a great idea. Good post! Cool, but will increase the chance of vignetting on a wide lens with a fader (say for example the tokina 11-16 and a fade ND? I can’t say I’ve tried it (don’t have that lens, hopefully someday). But in theory yes, it will extend the filter ring. But then again an ND filter wouldn’t really help on a lens that wide. You won’t get much shallow DOF. Other option is using 4x4s if you are desperate. Do you think it can affect electronics of lens/bodies such as internal focusing motor or so? Thanks. No I don’t think so. These guys have spent 5 years developing this. I doubt that would be something they overlooked. And the magnets don’t have strength until you have the filters around 1/2″ away. So there reach is limited. t3mp— they have no effect on your lenses, camera or flash memory. As Caleb noted, they will barely pick up a paper clip from an inch or so away. The attraction is very concentrated forward and falls off quickly. I sometimes like to use faders to control my exposure gradually in more subtle ways (or if I want to do anything funky, like shooting towards light sources). But as you say, I might not bother half the time, simply because screwing those threads is a pain. Increased vignetting is a shame but not a deal breaker – I think I’ll try these out at some point! To the xume guys, how about combining a step up ring with the magentic connection? Then I could travel with just one big fader ND that I could snap on to all my lenses – that would be sweet! 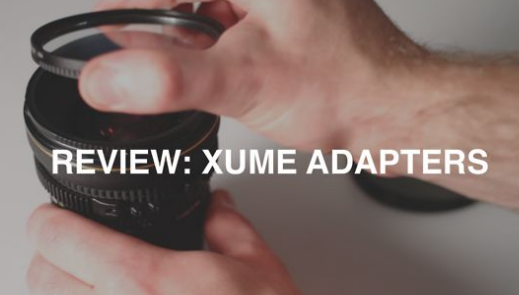 When using the Fader ND, will the Xume slip or does it keep its tightness. For quick Iris ND Pulls. I’m just worried I’ll end up with the whole thing in my hand and in my shot. Seems to work fine for me. That looks pretty sweet! But I do have one question. As you know, many videographers and photographers buy filters simply, among other obvious reasons, to protect their lens in case it gets dropped. My question is this. Will the magnetic mount/connection to the lens protect the lens the same way a normal screw-on filter would? I’m quite curious to see a drop test with this system. In my mind, I can kind of imagine the magnetic filter popping of when dropped, damaging the lens where a normal filter would better protect it from any real damage. Love the podcast! Keep up the good work! Love them, they seem strong and are huge time savers.. What do Xume mean by “pop your lens cap into a holder..”?! I have them sitting here in front of me.. One adapter for the lens and two holders for the filters…. Been a long day, maybe aI’m missing something?